Accent is a professional eCommerce website template coded with HTML5, CSS3 and Bootstrap 3.3.1 latest version. This template suitable for fashion, shopping, clothing, wholesale dresses and similar websites. This HTML5 theme has 4 skins. You can choose your favorite color scheme from these or replace your own color codes with existing one. It comes equipped with a multi level full width megamenu that allows you to display all the major categories for your visitors. Its featured and bestseller sliders attract and engage your visitors and drive transactions. 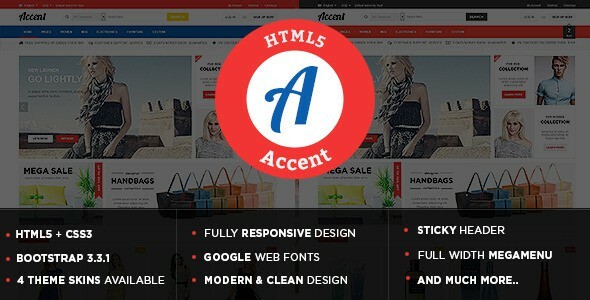 Item Reviewed: Accent Responsive eCommerce HTML5 Template 9 out of 10 based on 10 ratings. 9 user reviews.